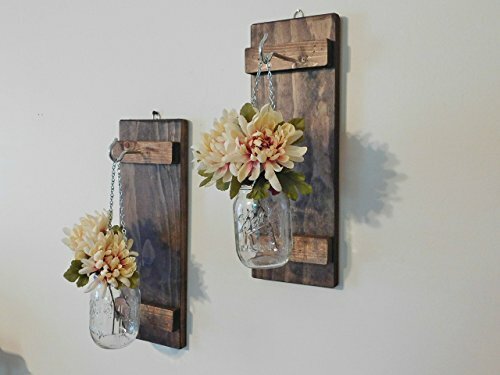 A Pair of Rustic Hanging Mason Jar Wall Sconces Great for displaying flowers or as a candle holder. A great rustic decor addition to any home or office as well as wedding decorations. Candles and flowers are NOT included. Each board is approx 16" Tall and 5 1/2" wide with a hanging pint 16 oz Jar attached by a hanging silver chain. This Listing is for a Set of 2. Wood may vary slightly from what is shown in the photos. Each piece may vary slightly with regards to scratches, knots, stain color, etc. If you have any questions about this product by Twin Oak Rustics, contact us by completing and submitting the form below. If you are looking for a specif part number, please include it with your message.